Captain Marvel is the first film in the Marvel Cinematic Universe to have a female superhero as the lead character, a huge milestone for the franchise but it also marks the final stop before the end of Phase 3. The film was in talks for quite some time over how it was going to go ahead, which version of Captain Marvel was going to be used and whether they were going to stick with Carol Danvers and fortunately they decided to do that. However, this has not exactly been one of the most hyped Marvel films in recent memory, I think that is due to the fact that this film is going to be coming out just before Avengers: End Game and considering how cataclysmically epic that film was and how much we’re all excited to get round to Avengers: End Game, I think this ultimately was going to feel like a damp squib. However, the post credit scene of the Avengers: Infinity War directly referenced Captain Marvel so we knew that this film might, at the very least, be a set up towards that film. The film has been written and directed by the team of Ana Boden and Ryan Fleck, the team behind films like “Half Nelson” and “Sugar”. When I heard that they were going to be behind this film, I was actually rather surprised, considering that they had done a lot more television work than film work, which ultimately could have been an odd decision, however, I also did notice some prominent Captain Marvel comic writers were overseeing the story as well, so that gives you some hope. Captain Marvel is actually an MCU prequel of sorts. If you’re familiar with the MCU timeline, since this takes place in 1995, that is after Captain America: The First Avenger and before Iron Man. Captain Marvel is the story of Vers, a Kree warrior who is commanded by Yon-Rogg, who is played by Jude Law in their battle against the Skrull, a species of shape shifting aliens who can take on the form of any person that they see, right down to the DNA, but can only copy the recent memories. A squad of Skrull get in from capture during a mission and get information that a device they are looking for is on earth. Vers follows them to earth to take down the Skrull team, led by Talos played by Ben Mendelsohn, where she runs into a young Nick Fury, played by Samuel L Jackson who starting up S.H.I.E.L.D, although he is not quite leading the whole operation at this point. Basically, this film kind of half adapts the story’s secret invasion which is an interesting choice for just a Captain Marvel story, to say that the invasion was pretty much an event comic, if anything it could easily be an Avengers’ storyline, however, where Captain Marvel goes with it is actually rather interesting, however I do have to stress, if you read a lot of Marvel comics not much will surprise you here. Captain Marvel’s plot is actually rather more streamlined than many of the MCU films have been in recent memory. Whilst it is ultimately a character set up film, rather like Antman and Spiderman: Homecoming, it ultimately feels like a filler to get us to the next Avengers’ movie, it doesn’t create the massive impact that say the Captain America films do. That leads me to the Skrull, who are actually very well done in this film, one of the few real surprises in this film and they really work in their role as antagonists, and despite the fact you see most of the plot twists coming, one of the twists to the film is actually rather surprising. That being said, however, Captain Marvel is a pretty basic fish out of water story. The 90’s setting is not just in the landmarks like Blockbuster still being around and the very heavy grunge soundtrack, it also has the look and feel of a 90’s blockbuster especially in the first half being on earth. 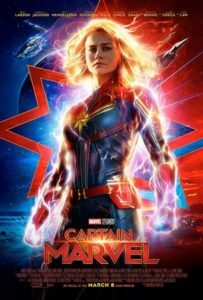 The second half actually kind of redeems the film, if anything the first half kind of dragged and was very exposition heavy, it is at that point it becomes more of a character piece on Captain Marvel herself. Her origin story is mostly kept intact with only a few minor changes but ultimately, I really quite like where they were going with this film and Captain Marvel herself is an excellent lead. I can certainly see future films with this character in the future of the Marvel Cinematic Universe. The action scenes, for example, are actually really well done and they work really well with the power set that Captain Marvel has and for Marvel fans seeing the Skrull’s shape shifting powers is a really great effect. In fact, the effects in this film are really the best part, especially the effects to make Samuel L Jackson and Clark Gregg reprising his part of Agent Coulson making them look like younger versions of themselves, Jackson looks like he’s stepped out of some of his films from the 90’s. Nick Fury and Agent Coulson aren’t the only throwbacks to other Marvel films, because this is set in the past, we also get other characters, particularly from the Guardians of the Galaxy films, Germain Hunt reprises his role from Guardians of the Galaxy and as the trailers pointed out we also have Ronan the Accuser, the villain from the first Guardians of the Galaxy film in this one, once again played by Lee Pace, the latter of which feels very underwhelming. The performances are pretty good across the board. I heard that people were sceptical about Brie Larson in the role of Captain Marvel, but I was definitely not one of those people when she was announced for the role and I was completely correct, Brie Larson is brilliant in the role and gives a great performance. Samuel L Jackson is finally allowed to have something to do in one of these films after such a long absence and his presence really adds something to the film, even if his performance can go a little bit to waste since you might end up concentrating a bit more on the effects and the fact that his character is finally given something to do. Other great performances include Jude Law, who I thought would be a bit out of place in this film, but he actually takes to this role really well. Annette Benning who once again gives a very good performance. Even the smaller roles are pretty good. Ben Mendelsohn proves that he is an underrated actor. Fan of Humans may struggle to recognise Gemma Chan’s small bit role. Aesthetically, however, this film is still the Marvel Cinematic Universe for the most part. There are definitely parts that make it feel like it is taking place in the MCU especially parts involving the Kree and the space aspects of the film, when we’re on earth, however, it feels a bit more separate, probably because of the 90’s setting because we’re used to the Marvel films being a bit more modern and I reckon that could be a bit more jarring. Captain Marvel ultimately has an underwhelming first half, but the second half makes up for it and I really thought the film was really good by the end and I think it is rather a genuinely good set up for the Avengers: End Game next month. As a film franchise goes I think Marvel could easily stick around with this character, however if I were to compare it to the DC equivalent of this milestone that being Wonder Woman, I think Wonder Woman was a more consistent film and did more interesting things with the character and plot than this this film did but that’s not to bash Captain Marvel which would easily watch again. I saw this film in 3D, but I don’t think this is actually worth it as much outside of a few scenes, especially scenes involving flight, where height was a factor and scenes with the Supreme Intelligence. If you have liked the Marvel Cinematic Universe up until now, this is not one that you should skip despite the rather mixed reviews from critics. That’s it for this review, I think next time I’m going to review a more down to earth film, so I am going to review the latest British film that has come out, Fisherman’s Friends. With that being said I hope you have enjoyed reading this review as much as I have enjoyed writing it.